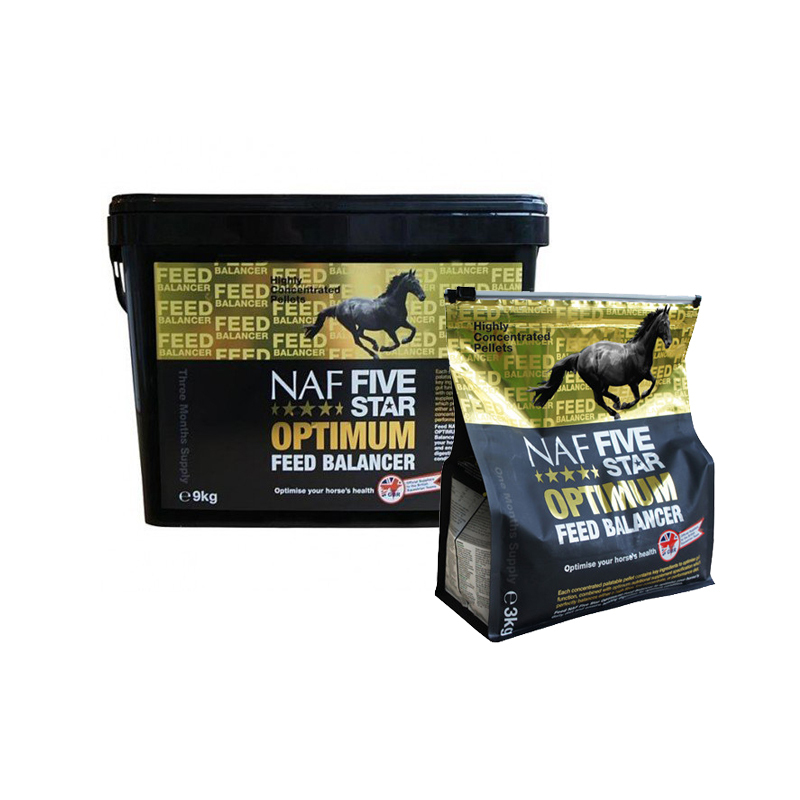 NAF Five Star Optimum will help restore and maintain five star condition and health, maximise the nutritional value of the daily feed ration, and optimise the health and efficiency of the digestive system. Optimum comes in a highly palatable pellet form, which is concentrated and easy to feed. It is of the highest supplement specification and has a great sugar-free flavour. Optimum is formulated to complement either a high-fibre, low-concentrate, or performance diet. When a daily feed is not necessary, Optimum can be simply given on it’s own, directly from your hand. It is designed to optimise every horse's diet from family pony to performance athlete. Add to daily feed ration. Do not exceed recommended levels. One 130ml scoop provides approx. 100g. A 3kg bag fed at 100g per day will last approximately 30 days. Composition: Forage meal (Lucerne), Calcium carbonate, Wheat feed, Brewers' yeast, Maize, Mint, Ginger, Dicalcium phosphate, Whey protein powder, Dandelion leaves, Oligofructose (dried), Saccharomyces cerevisiae extract, Wheat protein, Sodium chloride, Rapeseed oil, Linseed oil, Licorice, Elecampane, Whey powder, and Magnesium oxide.